Last week Mark Hileman was interviewed by Cindy Marks of Artizen Magazine and we have been waiting (impatiently) for the new issue to hit our inbox. What a pleasant surprise! Cindy did a great job sharing Mark’s background and shedding some light on how the jewelry has evolved and grown into what it is today. 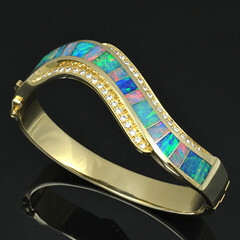 The article also includes some nice photos and live links to all of our jewelry and social sites. Phoenix, AZ – February 2, 2011 – WeddingWire, the nation’s leading wedding technology company, is thrilled to announce Hileman Silver Jewelry has been selected to receive the prestigious annual WeddingWire Bride’s Choice Awards™ 2011 for Wedding Ring Designers! Hileman Silver Jewelry stands among the top five percent of wedding professionals in the WeddingWire community, representing quality and service excellence within the wedding industry. Awards were given to the top wedding professionals across 20 service categories, from wedding venues to wedding photographers, and were based on the overall professional achievements throughout the past year. We are happy to announce that Hileman Silver Jewelry is among the very best Wedding Ring Designers within the WeddingWire Network, which includes leading wedding planning sites WeddingWire, Martha Stewart Weddings, Project Wedding and Weddingbee. We would like to thank our past clients for nominating us to receive the Bride’s Choice Awards™ 2011. 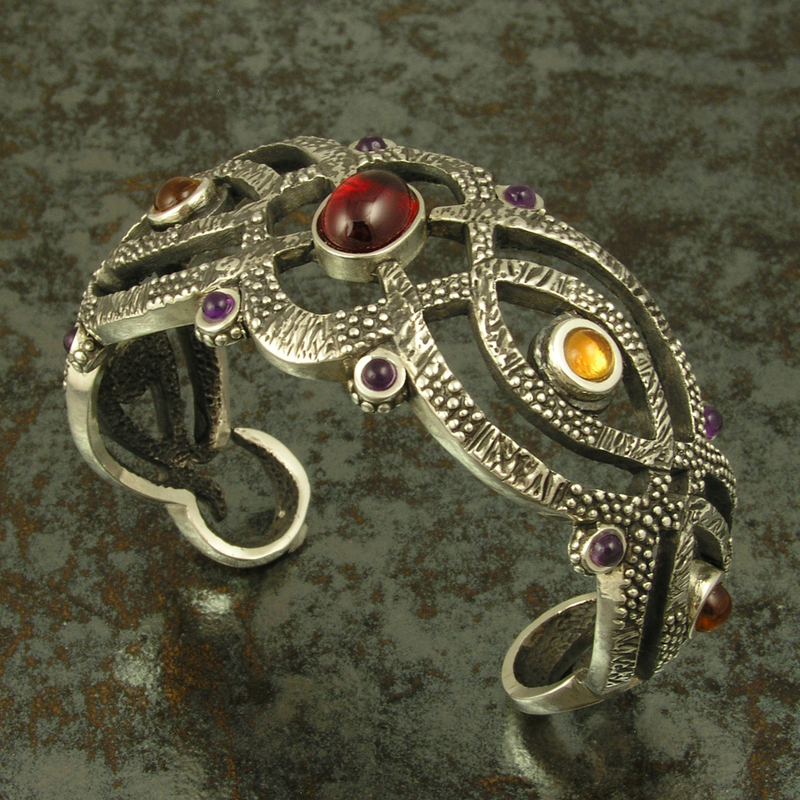 For more information, please visit our WeddingWire Storefront today at www.weddingwire.com/hilemansilverjewelry. Thank you to all of our customers for taking the time to leave valuable positive feedback on your recent purchases. Without it, this recognition would not be possible. Not too late for Christmas orders!! With Christmas quickly approaching, many people still have not decided what to buy for those on their “nice” list . Well, it’s not too late to order Hileman jewelry for that special someone. Although we usually advise allowing us 2 to 3 weeks for special orders, the holiday season puts the elves here in overdrive so a quicker turn around time is possible. A suggestion for gifts is to purchase the stock ring to wrap as a gift and return it for one in the correct size later. Just let us know when ordering that it is a gift purchase and we will extend the return period until after the holidays. Pendants and earrings are always a great gift choice because you don’t have to worry about getting the finger size correct. 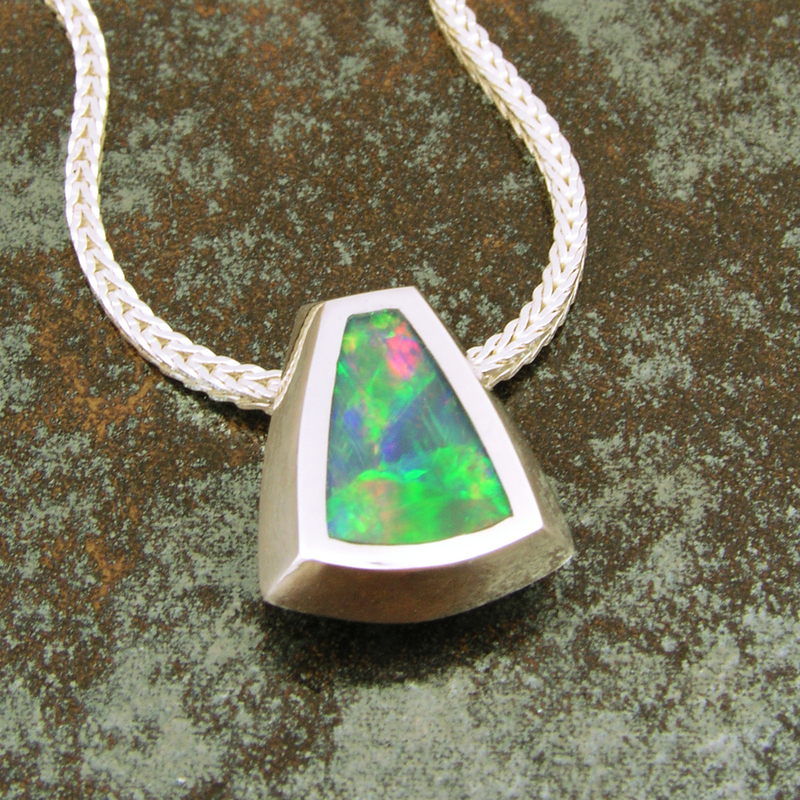 We have pendants available ranging from $130 in sterling silver to $12,800 in gold. Please contact us to check on availability and delivery time for jewelry orders between now and Christmas. With several different locations selling our jewelry and less time to update sold inventory, not all jewelry listed is available for immediate purchase. All of our rings, earrings, pendants, necklaces and bracelets arrive in a nice presentation box ready for gift wrapping. Express shipping is available for an additional charge. Visit our websites and get your stress free shopping done early. www.HilemanSilverJewelry.com and http://www.etsy.com/shop/thehilemancollection for our silver jewelry. www.TheHilemanCollection and http://www.etsy.com/shop/hilemanjewelry for our gold jewelry. You have scoured the internet and local jewelry stores looking for that perfect piece of jewelry but just can’t quite seem to find it. Working with a jeweler to create a “custom” piece of jewelry might seem like too daunting of a task. The extra time involved and costs incurred to create a custom piece may also be prohibitive if you are short on time or on a limited budget. 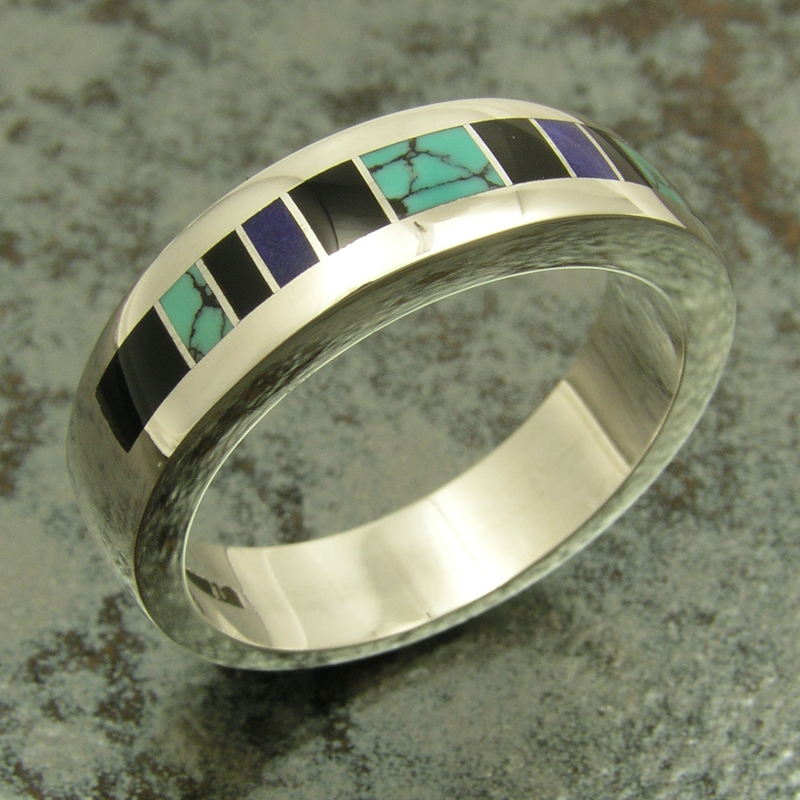 What if you could get involved in the design process of your jewelry by selecting the color of the inlay stones used, as well as the arrangement of the stones, to create a semi-custom piece of jewelry just for you at no additional charge? Hileman Silver Jewelry will work with you to do just that. We will guide you through the design process and advise you on which stones are appropriate for your chosen casting style and if any of the stones selected are an upgrade. 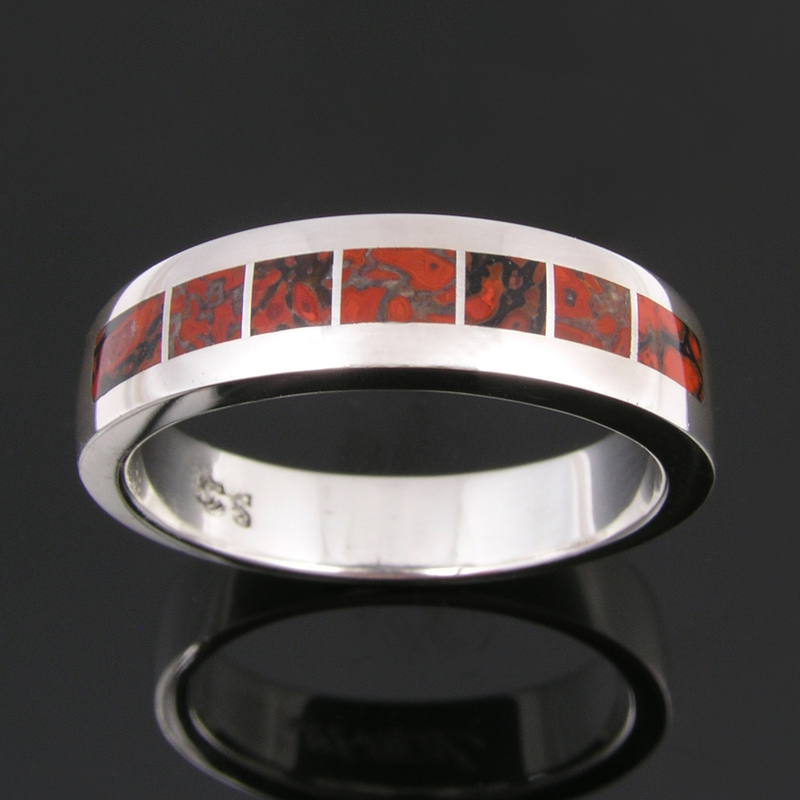 All of our sterling silver jewelry is easily customized to our customer’s inlay color choices or arrangement. 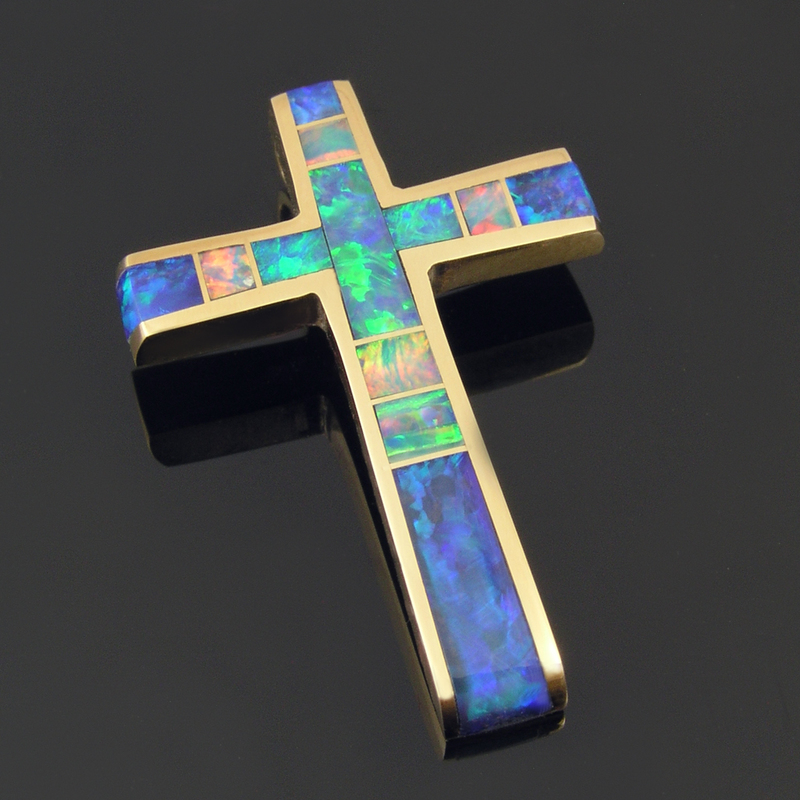 Every style ring, pendant, bracelet or earring casting is a blank canvas with almost unlimited choices of colored stones to inlay in the combination of your choice. If the jewelry piece has a faceted gemstone to accent the inlay and you want to change the color scheme, a different color stone of equal value may be substituted for the original. Additional charges are only charged if the accent stone or the inlay material is an upgrade to a more expensive stone. You might notice our style numbers on some of our jewelry descriptions. The style numbers only designate the casting/mounting used and not the inlay material used or its arrangement. 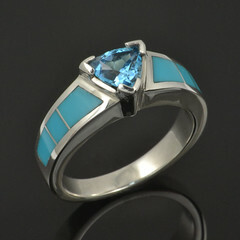 Here are some examples of our gent’s ring style “M200” and the different inlay color combinations we have done recently. 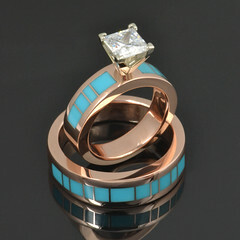 As you can see the look and feel of the ring changes dramatically with the inlay color and pattern variations. 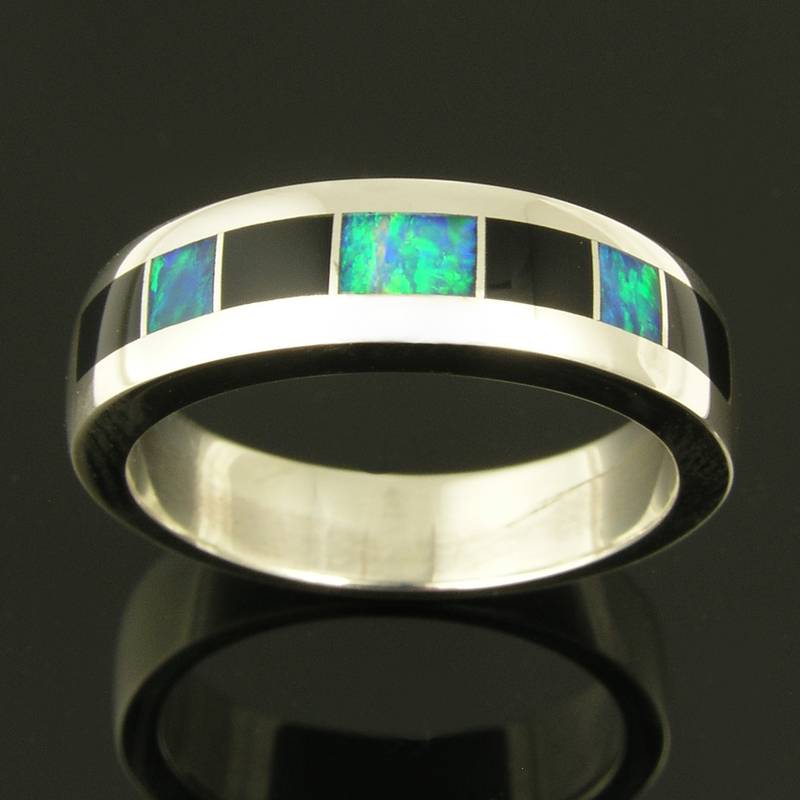 Here is the M200 ring casting inlaid with black onyx and Australian opal. 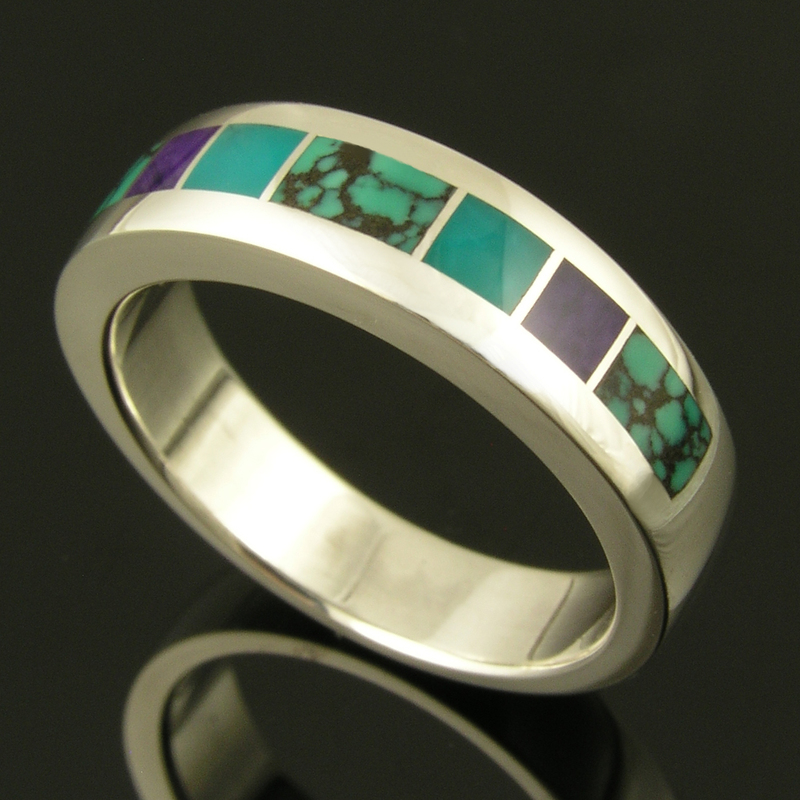 This is one of our most popular color combinations for our men’s rings. 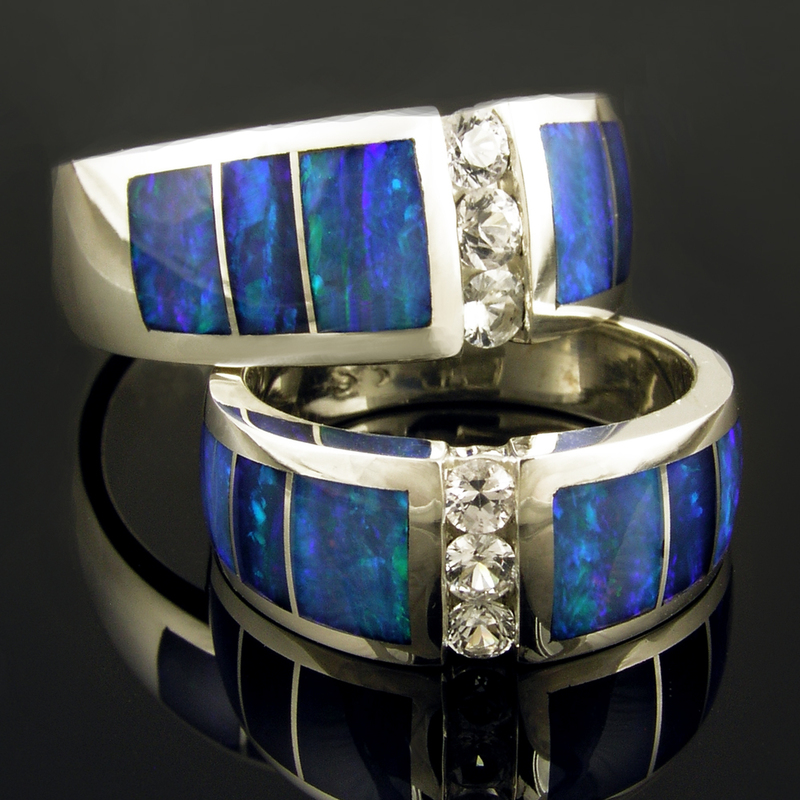 Another option available is inlaying the entire ring with all the same material such as all dinosaur bone, lapis or spider web turquoise like these three rings. 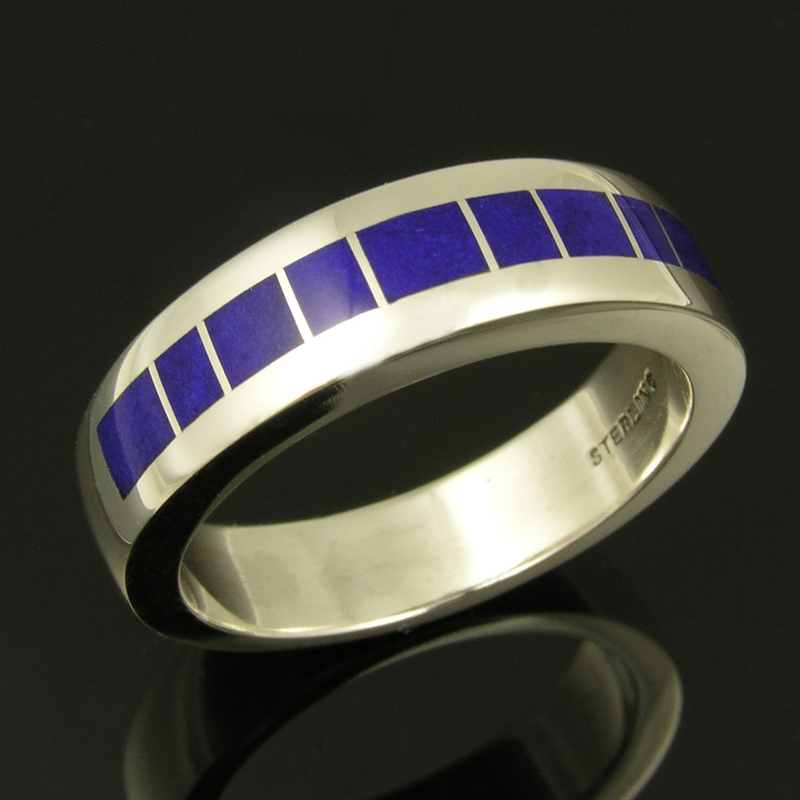 Sterling silver man’s band with blue lapis inlay. 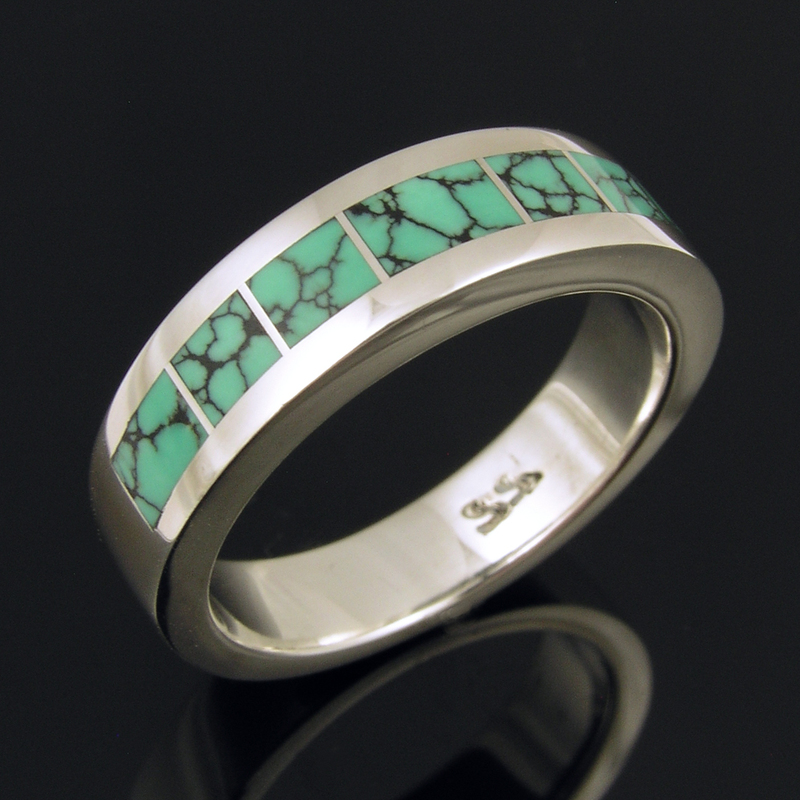 Sterling silver ring inlaid with gem dinosaur bone. A combination of inlay materials is also an option. Here are a couple of multi-color examples.